We offer a loving Christian environment for children to build a solid foundation for their future entrance into elementary school. For further information, please contact Amy Chavis, Director, at (910) 692-7912 or slcamychavis@gmail.com. Click here to download and print a copy of the 2018-2019 Sonshine Learning Center School Calendar. Click here to download and print a copy of the Child Medical Report form. Sonshine Learning Center is currently registered FULL for the 2018-2019 school year. Please contact Amy Chavis, Director, at (910) 692-7912 or slcamychavis@gmail.com with any questions or concerns. Thank you! * A 10% tuition discount will be given on the second child in a family. Throughout the year, Sonshine Learning Center holds "Spirit Night" fundraisers at Chick-fil-A on Hwy. 15-501 in Southern Pines from 5:00-7:00 p.m. Upcoming "Spirit Night" dates are posted on the church calendar on the home page. Come on out and support us! 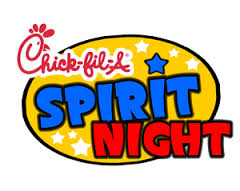 What is Sonshine Learning Center Spirit Night? When you attend a Spirit Night, you are helping Sonshine Learning Center earn a percentage of your total receipt. Dine in or drive through anytime between 5:00-7:00 p.m. on Spirit Night to support Sonshine Learning Center!